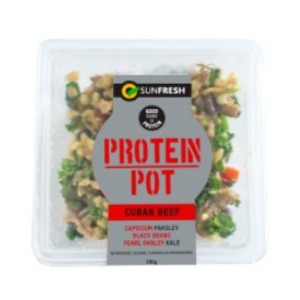 Sunfresh Protein Pots are fresh and convenient salads that are higher in protein; one of the most important nutrients our body needs. Featuring superfoods like quinoa and kale, these nutritious and delicious salads are the perfect accompaniment to any dish, or use them as a base to create your own delicious meal. Fresh, delicious and ready to grab and go! 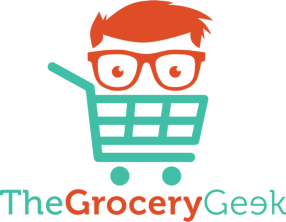 Available in 3 different flavour combinations representing different cuisines, there is something for everyone! 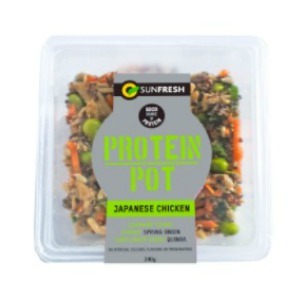 Japanese Chicken – with edamame beans, carrot, spring onion, sunflower seeds and quinoa in a Japanese dressing. Cuban Beef – with capsicum, parsley, black beans, pearl barley and kale in a Cuban dressing. 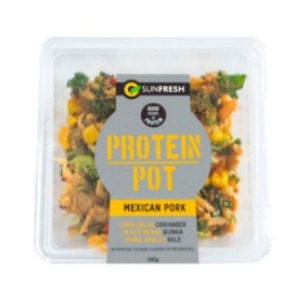 Mexican Pork – with corn salsa, coriander, black beans, quinoa, pearl barley and kale.